The Pancake Movement is much more than a fun name for a company. It is a fresh, creative agency serving up the hottest campaigns and content on the web. 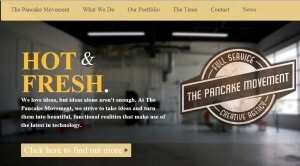 Andy Vitale and the team with The Pancake Movement specialize in branding and out of the box marketing strategies as well as usability to ensure that the website or app we design will provide the optimal end user experience. The Pancake Movement is only six months old, and is growing a client base quickly. They have already worked on a joint venture with Kitche Branding for Blackberry Latin America. As a team, they were able to meet the deadline and exceed the target goal. It appears great things are in the works for The Pancake Movement. MO: So we know it’s more than just a fun name, but you have to tell us, what is the story behind the name The Pancake Movement? Andy: It seems that people who hear about us always wonder where our name came from. Last December, my business partner Willie Morris, who was also running a co-working space at the time, decided to have us meet with two talented individuals he knew about pooling all of our resources and starting a company. That night we all hit it off and decided to work together. We ended up going to a famous diner in Ft. Lauderdale and trying to come up with a name. After trying to brainstorm for quite some time, I guess delirium started to set in and every name we thought of didn’t stick. I started to repeat “Mmmmm pancakes,” from an old cartoon I remembered as a kid and it stuck. The rest fell into place after that. I wish there was a better story behind the name but that’s the truth. MO: As a young company at only six months old, what do you believe is the most difficult part of the startup process? Andy: Where do I begin here? There are so many things that are difficult when starting a business. Especially when you have four creative people who have never worked together. It’s like Survivor, people form alliances about certain things. Everyone wants to prove how important they are to the rest of the group. The thing is, everyone has different personalities and creatives can be so different that at first it’s hard to determine who should handle what aspect of each project. People don’t want to step on each other’s toes in the beginning either. It all eventually falls into place and everyone ends up with a clearly defined role. You just have to focus on the projects and let everything work itself out. MO: You specialize in branding and out of the box strategies. Tell us about one of these unique strategies. Andy: When we started our company, we knew we had to hit the ground running. We asked ourselves, how could we make a great first impression and not only that, have people walk away with a smile? We knew we had a playful name and we designed a card that got us a lot of attention right away. We incorporated thick stock, spot UV and spot foil to prove that our image meant too much to us to have cheap business cards. We ended up taking it a step further, by making our cards smell like maple syrup. The reaction to our scented cards was more than we could have ever anticipated. Everyone we met instantly loved them and could not believe that our cards actually smelled like pancake syrup. There are even videos online of people smelling our card for the first time. Anytime we run into someone we have met before they always ask us to give one of our scented cards to their friends. This strategy still has people talking months later. MO: You mention creating optimal end user experience for websites and apps. What is one mistake you think many companies make on their websites that hinders a positive user experience? Locally, being based in South Florida, which isn’t exactly a tech hub, a lot of the problems are directly due to not being early adopters of new trends in technology. Overall, however, I think a big mistake that companies make is overcomplicating their interface and expecting users to just get it on their own. It’s good to know who your target audience is and to understand some of their thought process but the more complicated you make things, the more likely you are to have users leave and never come back. If you keep it simple enough to understand and easy enough to navigate, you will end up with better results. MO: Who would be your ideal client and why? Andy: This question is a lot harder to answer than it seems. Immediately I think about those clients who seem out of reach. Huge brands that we love and whose products we use everyday. They seem like they could be fun but ultimately I’d imagine that they are so entrenched in their own corporate culture that there isn’t much room for full creative control. For me personally, my ideal client are startups or relatively new companies in industries that are fun to be creative. I’d love to sign a beverage company as a client. Really, every client presents a unique opportunity for us and that is where we have the most fun. All of our clients trust us and our vision completely and we cannot thank them enough for that. MO: You mentioned that you started with four employees and two moved away, as a new company what do you look for when you will need to hire more people? When it comes to hiring employees, it seems for now the best fit for us is to hire people on a per contract basis. We have learned that certain individuals have their strengths and weaknesses, and it’s nothing to be ashamed of, we all have them. Others work well when not spread across multiple projects. For now, we are going to look to hire individuals to make up groups for specific projects so that we can utilize their strengths. When the time comes to hire someone on board full-time, we will be looking for individuals that excel in specific areas and maybe one or two well-rounded utility players.